Today's project is to put Koda's Keeper together. This is the final layout I've decided upon. I'll adjust the size of the sashing as the sections are put together so that they will all finish in this width and length. You know how tricky that can be. 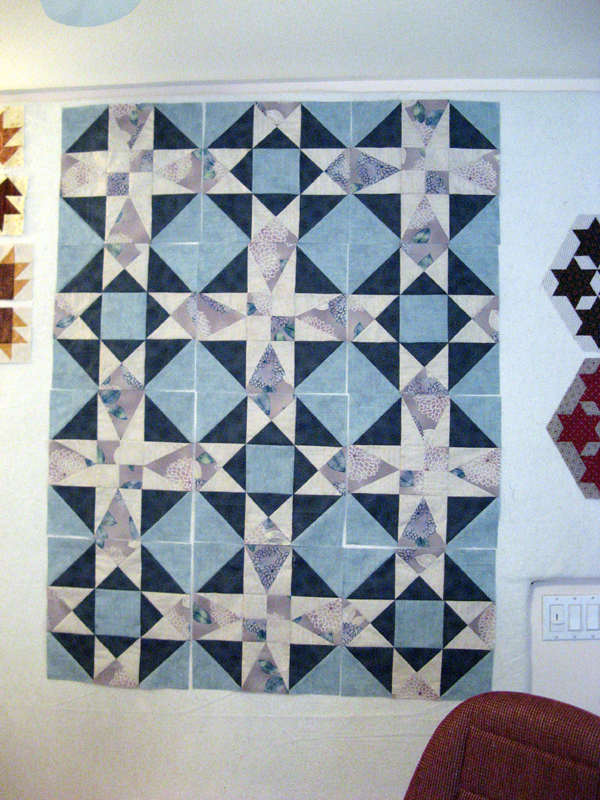 There are two sashing pieces going the wrong way, they are in the middle; I will be correcting this. For the outside border I'll be using my coupons from pre-registering for the San Diego Cruisin' Quilters Shop Hop. I'll be trying to match the background of the HST Bear Paws with a solid. I think the quilt doesn't need an inner border. What do you think? The Shop Hop starts tomorrow for those who pre-registered and Saturday for everyone else. There may still be time to pre-register to get 15% off purchases at each of the participating stores. If you want more information or to pre-register you can get to their site HERE. 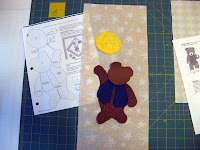 I've been organizing my projects and landed on Koda's Keeper as the project to work on this coming week. 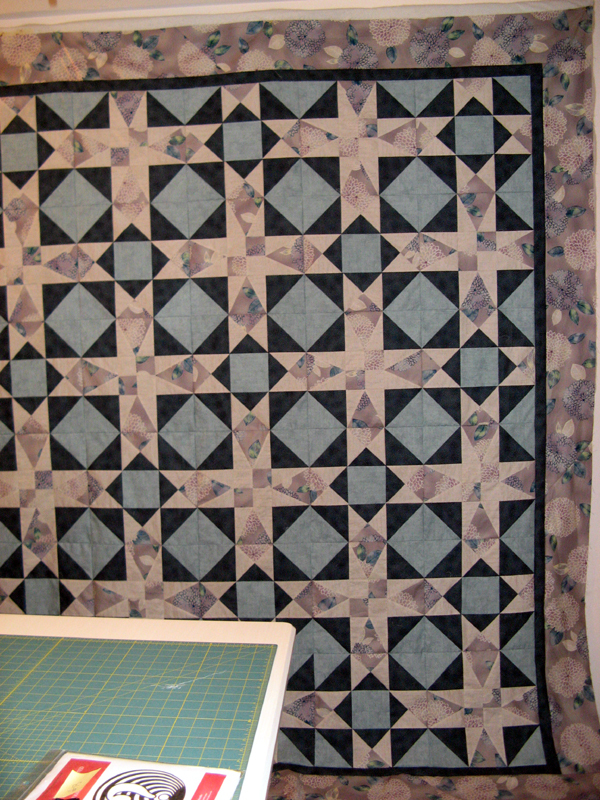 Koda's Keeper is a quilt that I was making for my brother Steve and his wife. 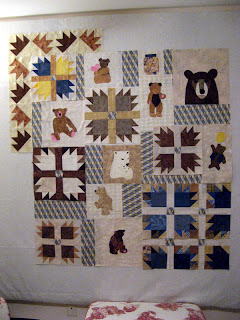 It was the adult quilt that kept with the theme of teddy bears. The teddy bear theme was for my niece Morgan's nursery. Morgan got Koda. Sadly Steve didn't get a chance to wrap up in Koda's Keeper because of his sudden passing just days after Morgan was born. I've not been able to work on this project, but now it's time. 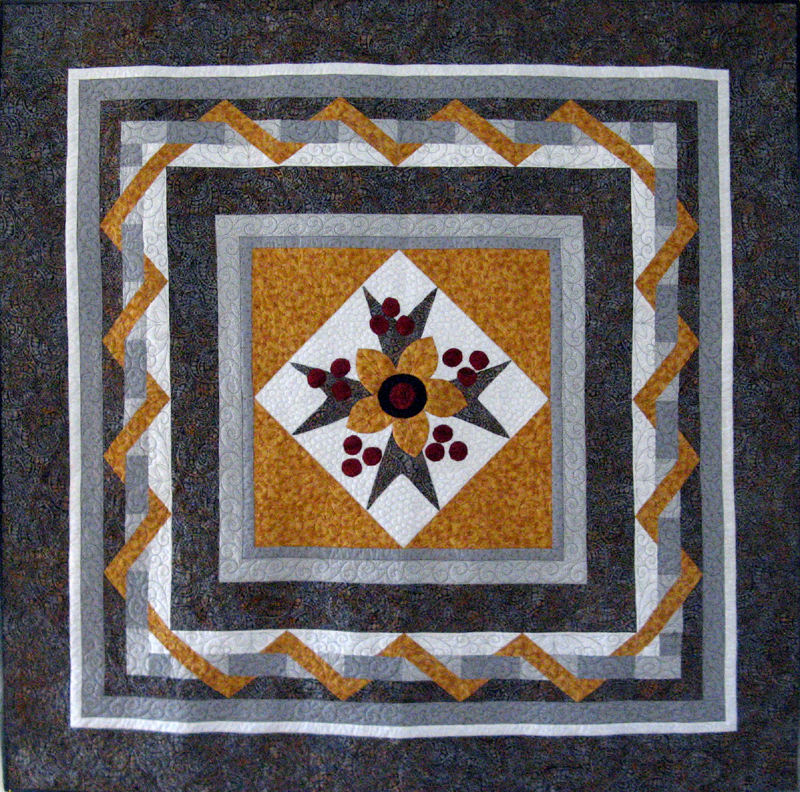 Koda's Keeper started as a block exchange with members of Canyon Quilt Guild in 2007. 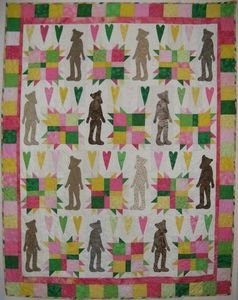 The only criteria was to make an adultish teddy bear quilt in browns with blues, yellows and accents in pink. Everyone followed pretty well. I've ended up with a bunch of bear paws and nearly as many bears. I'm still working on a layout along with an additional bear or two not to mention some more bear paws. 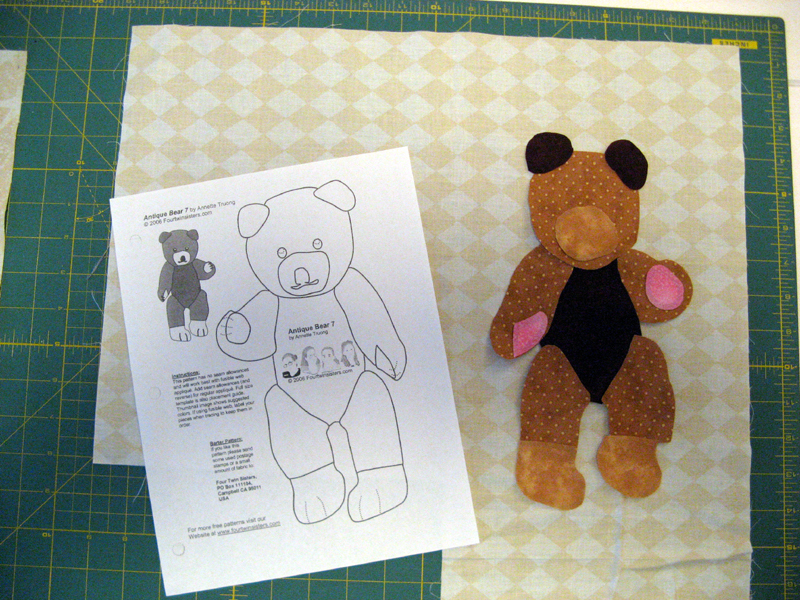 It is scrappy, but I held back many of the original fabrics to help with additions if they were needed. 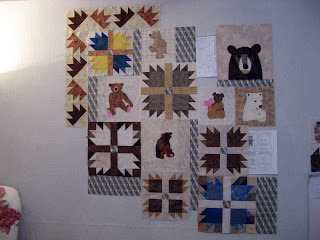 I'm rearranging a couple of the bear paws to get more of the blue and yellow into the quilt. 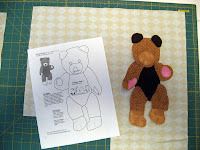 I just love the FREE Antique Bear applique patterns by Annette Truong of www.fourtwinsisters.com. I'm planning on at least one more if not two. I also have a pattern from a Quiltmaker Magazine, May/June '03 issue with a bear flying away by a balloon. This project is a 2011 UFO that gets finished in 2013! 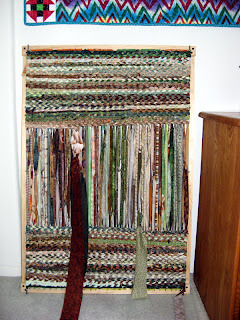 Find more inspiration through the links at www.patchworktimes.com. Enjoy the week ahead in your sewing room! I have a small completion this week. Kadette is my February 2013 UFO Challenge. 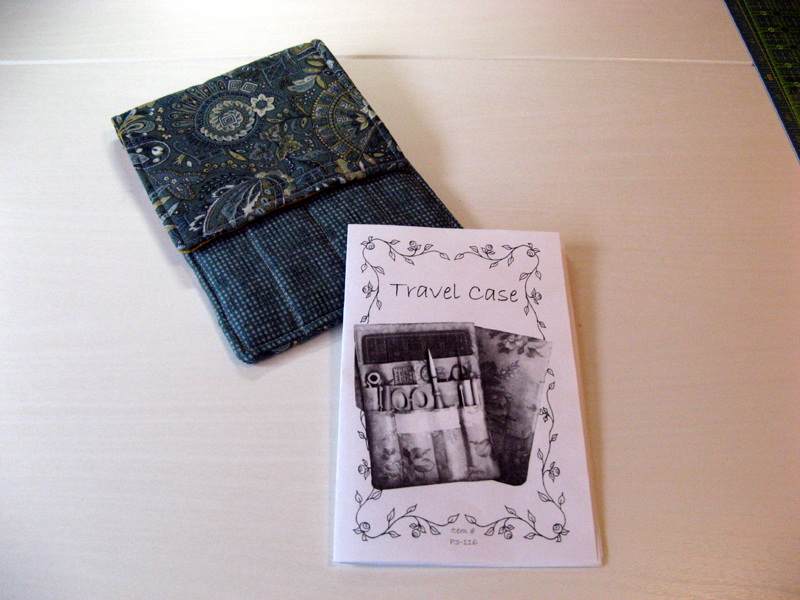 It is pretty small, but only used fabrics I had on hand...a reduction nonetheless. Check back tomorrow to see progress on Koda's Keeper. There are other quilters using up their fabrics. Find time to visit their websites through the links at www.patchworktimes.com. As long as the reds were out I whipped up Sunshine Quilters February BOM. February's BOM is being coordinated by Carol. I like the pattern she selected for us. I've not been winning any of the BOMs, so guess I can figure on not getting this one either. Well maybe my luck will change...one can only hope. Today I've got a back to put together. Will do everything possible to use up all the leftover fabrics. the back needs to be about 95" x 110". Eek that is big!!!! This is today's project on my sewing table. 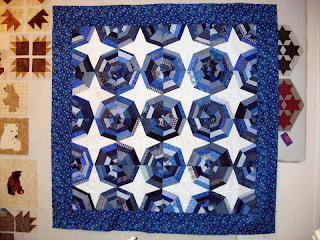 It is Kadette, my #4 or February UFO with www.52quilts.com (Thirteen in '13 Challenge). 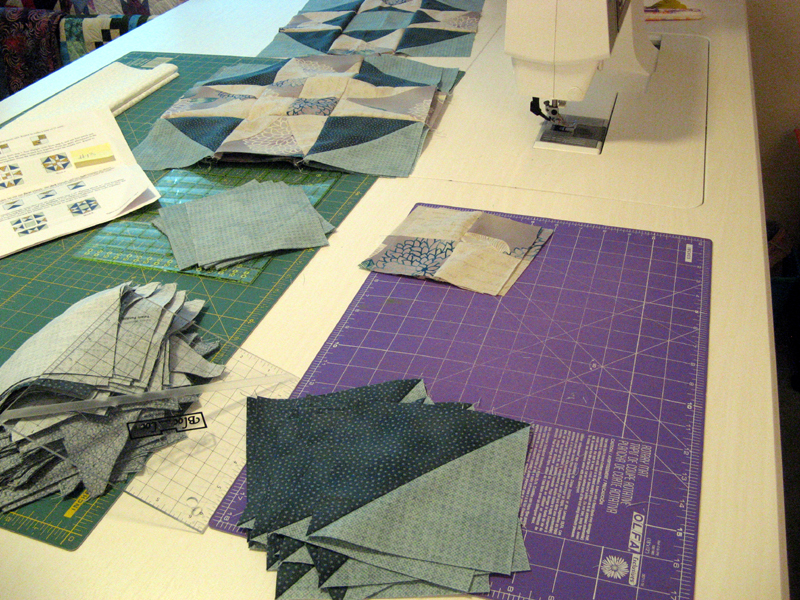 As you can guess it is a paper pieced project that is small. 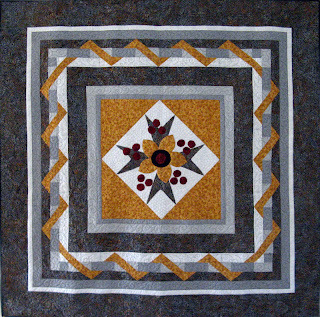 The finished project is 13 1/2" square. I have all the papers pieced now. 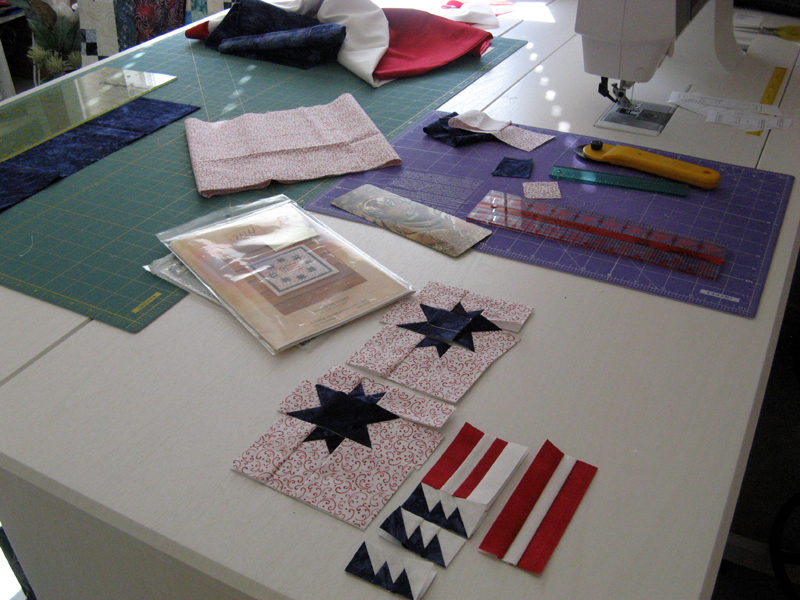 Next up is assembling the flag and stars into blocks...then to rows...then.... I'm hoping to have this done today. 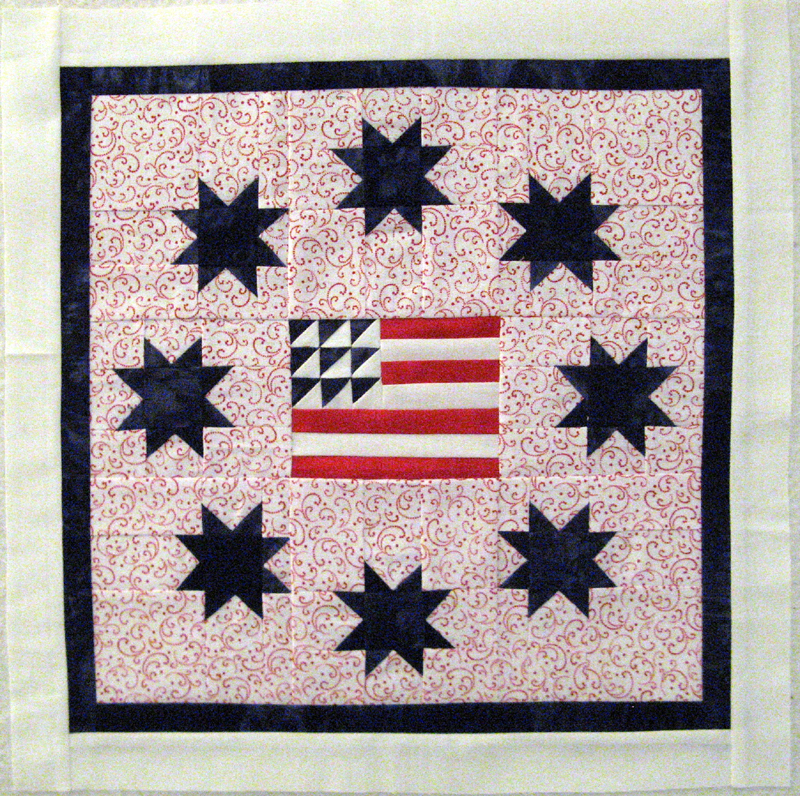 The pattern is United We Stand by Mary Herschleb Designs. The next two photos are my February finishes. 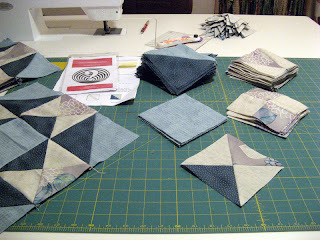 I got them back last week from Kerry's Quilting. First up is a Bonnie Hunter 2011 Challenge that she coined Cheddar Bow Ties. Did you know that Curly Cue is another name for Bow Tie? I collected blues and cheddars for about a year. The blocks finish at 3". 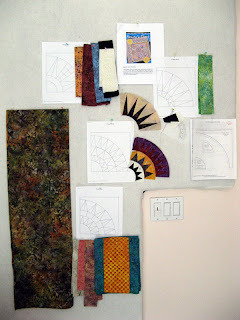 The second is a Karen Eckmeier project that I took as a workshop at Road to California Quilt Show in January 2012. The design is Scrappy Layered Log Cabin. 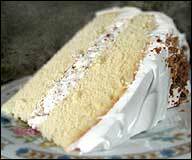 I just might have to add a little bling to it if my pal Sue has some extra. I call my project Krayons. I used a decorative stitch that I hadn't used before when adding the triangles on two sides of the border. The quilting accentuates all the color of the logs. It may look difficult, but it was fun putting this one together. 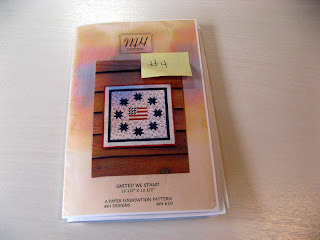 Let's start with my February UFO #4 with 52Quilts.com. My project is patriotic as you can see. 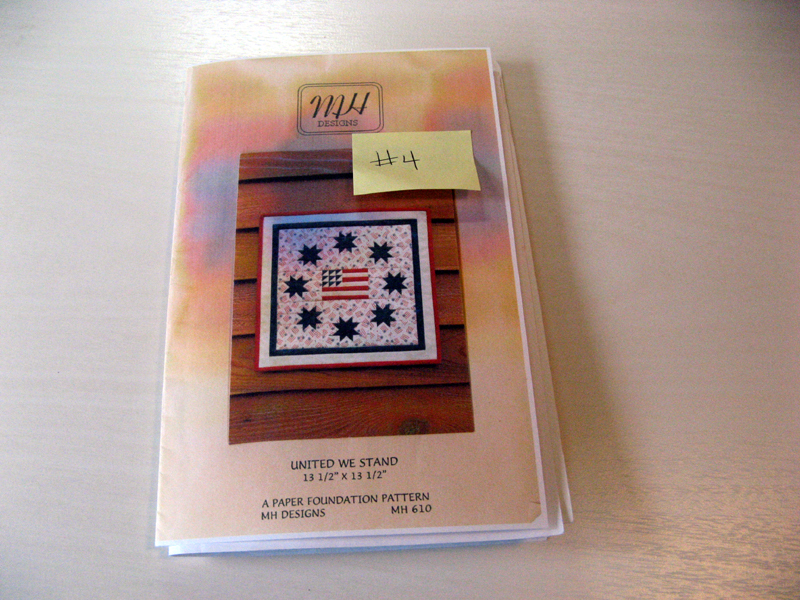 The pattern is called United We Stand by MH Designs (MH610). It is a small quilt that finishes at just 13 1/2" square. 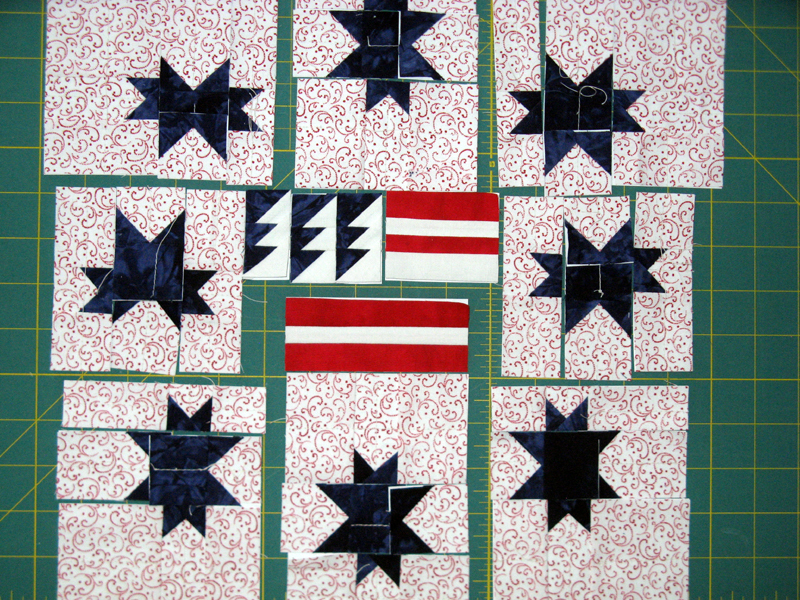 I've got two stars and the flag done today. I'm on track for a finish at the end of the month. 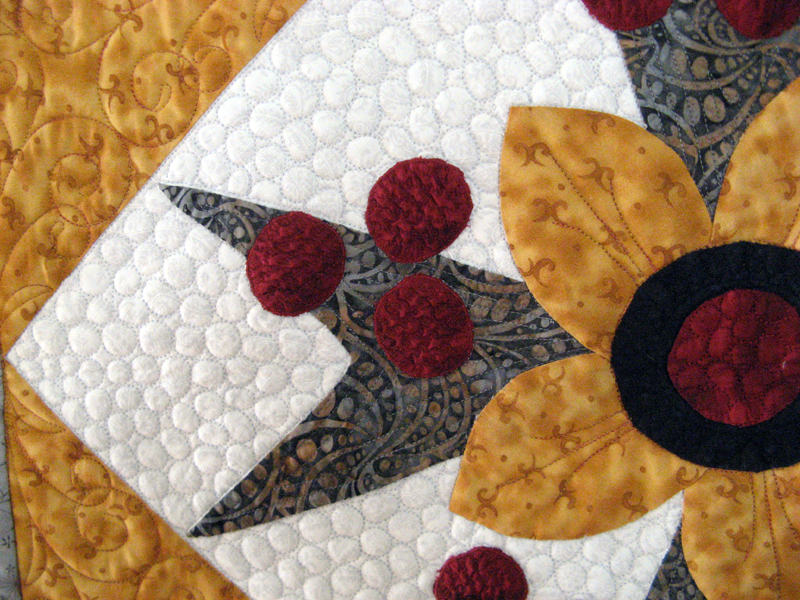 Next up and on the design wall is Beauty 'n Check by Cozy Quilt Designs. I took a workshop last Tuesday with Janice Ellertson at Bits and Pieces in Poway with what you see sewn what I finished that day. I've not had any time to work on it further. Background is on the left. The green will be the melon of a few of these blocks. It really stands up against the background. The background is out of my colors of choice. Thought I'd try to mix it up a bit with this Earthy print. This block isn't started yet, but these are the fabrics I'm planning to use. The neutral and dark will be consistent in each of the blocks. I'll be adding in fabrics that pull out the colors of the background in a very vibrant way. 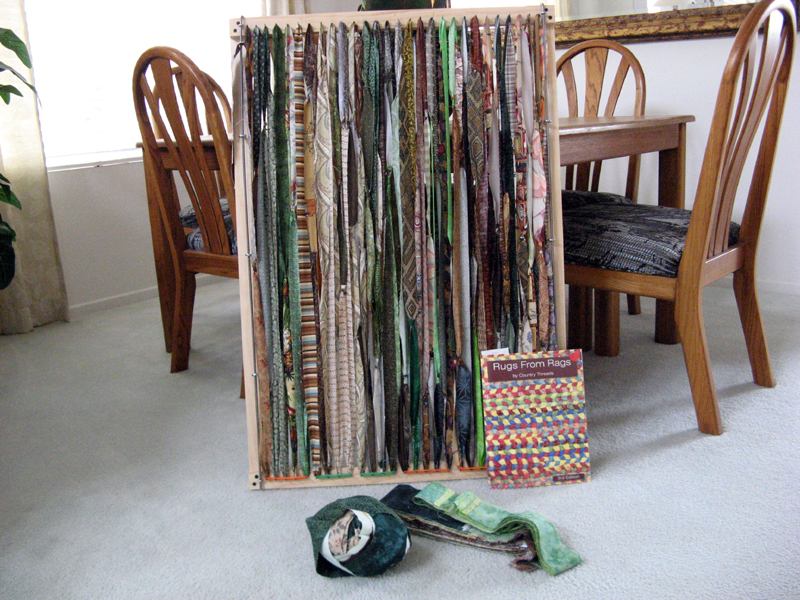 When I was at Road to California Quilt Show at the end of January, I purchased a loom for making Rag Rugs. Country Threads sells two sizes of looms. The rug loom is about 2' x 4'. Utmost in my thinking is that this would be a perfect way to use up my stash. I use these rugs in my home. 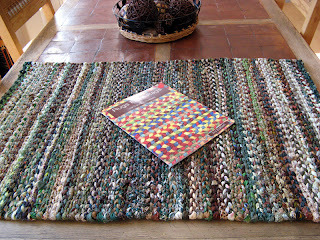 Finding the right colors can be difficult...why shouldn't I use what fabrics I have at home to make the perfect rugs? I started with a brown and green rug. 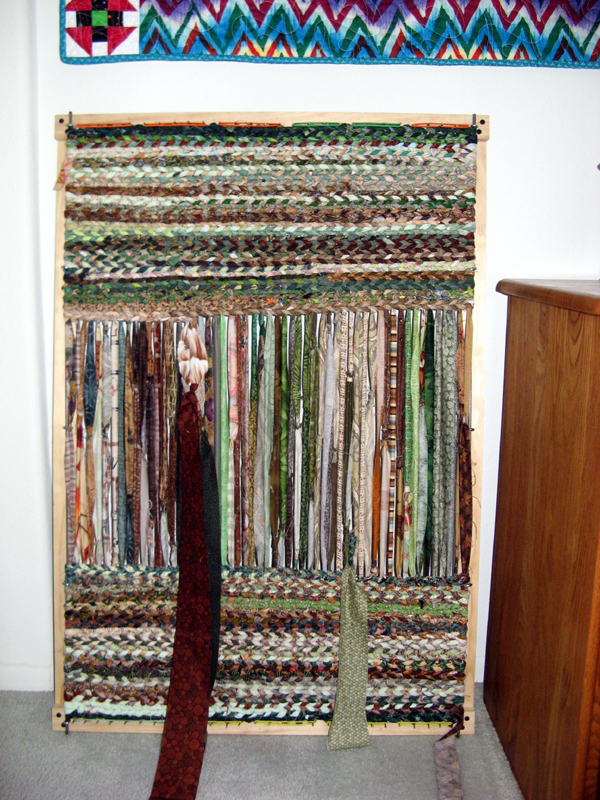 I used 1 1/4" warping strips and 2 1/2" weaving strips. There is now sewing; a very clever knot puts your strips together. If you want to use up some fabric how's 17 yards sound for one of these rugs? Oh an for those interested in placemats 4 yards can come from your stash! My DH wondered if he could step on it now....Koko didn't ask! Tonight I attend Canyon Quilt Guild's Monthly Meeting where we'll hear from Ann Turley. It is a Friends Come For Free lecture so come and tell them kwiltnkats is your friend. 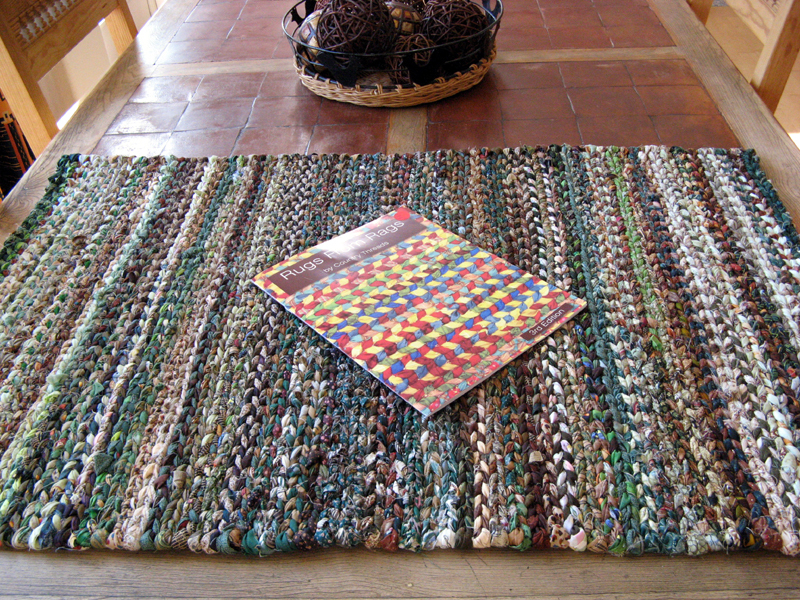 For more inspiration check out the links through Patchwork Times. 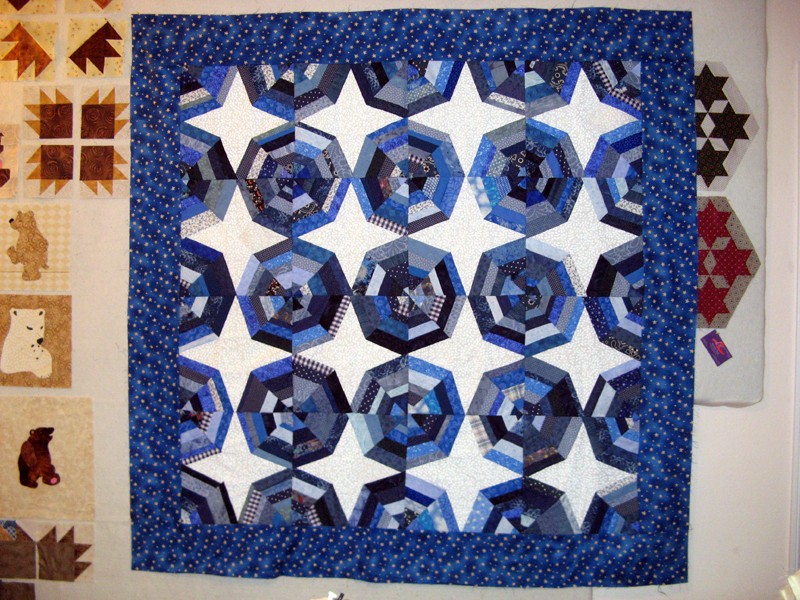 I wasn't able to get a photo of the entire quilt because it is just too big! 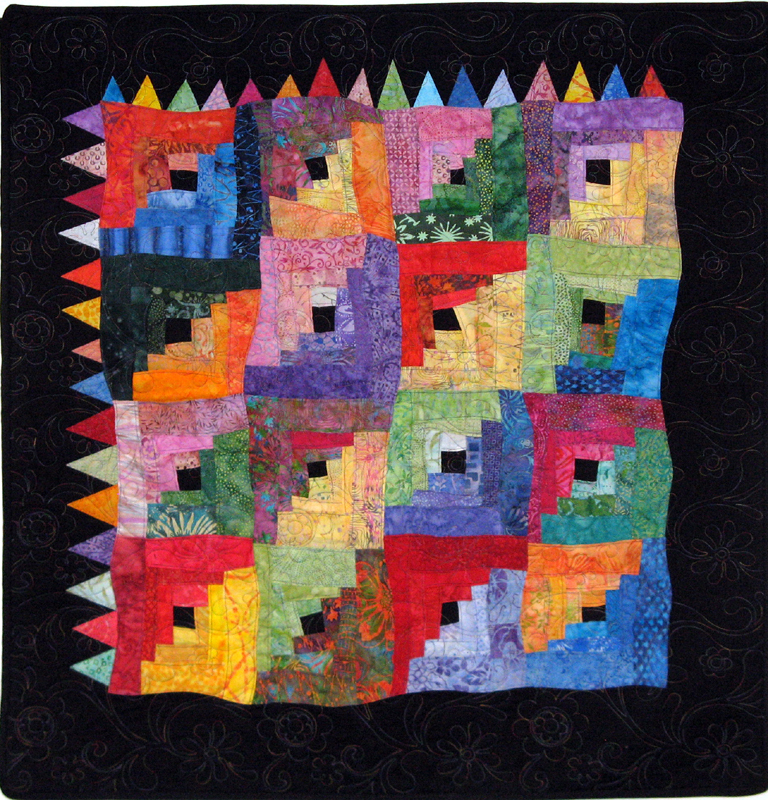 This project by Karen Sievert called Expect the Unexpected was one of the classes I took at Road to California Quilt Show in January. It was the mystery on Friday night that started at 6pm and went until midnight. This project is my #13 UFO; my extra credit done way ahead of schedule. I've got something to report as USED! I did add to my stash though at Bits and Pieces for the Beauty 'n Check Workshop. I knew I had to purchase 2.5 yards, but kept having cut the wrong fabrics.....urgh! Until next time enjoy your sewing room and find inspiration to move your fabrics like other quilters through the links at Patchwork Times. Hope you celebrated Fat Tuesday the way it should be done! I had my own rendition...a class with Janice Ellertson at Bits and Pieces in Poway. The project was her and Jodel Yover's design Beauty 'n Check. The clever part of this paper pieced New York Beauty is to use OESD's Light Weight Tear-Away Stabilizer sheets that you can purchase by the roll or cut into 8.5" x 11" sheets that fit right into your ink jet printer. 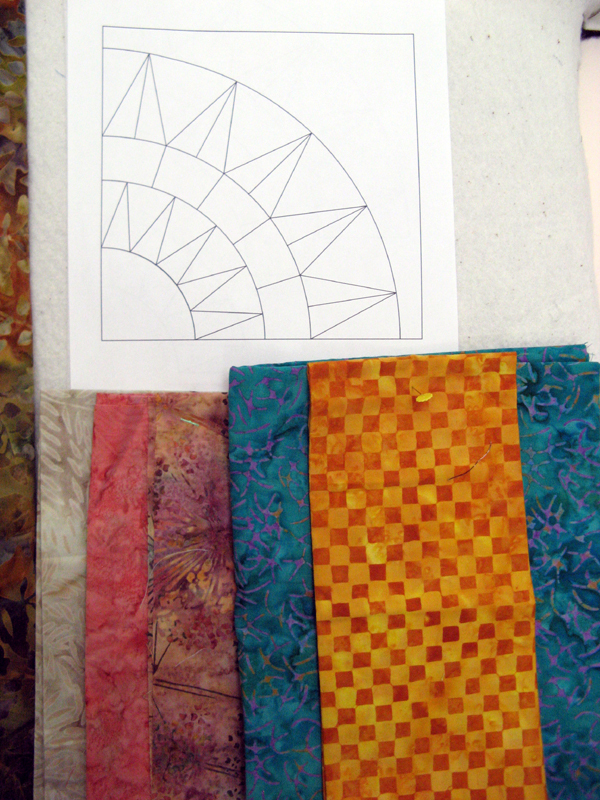 I'll be making the 56" x 56" wall hanging. I got two blocks started. I'll be going out of my color ranges for this project. I have a earthy Fall tones background that will use more muted colors. 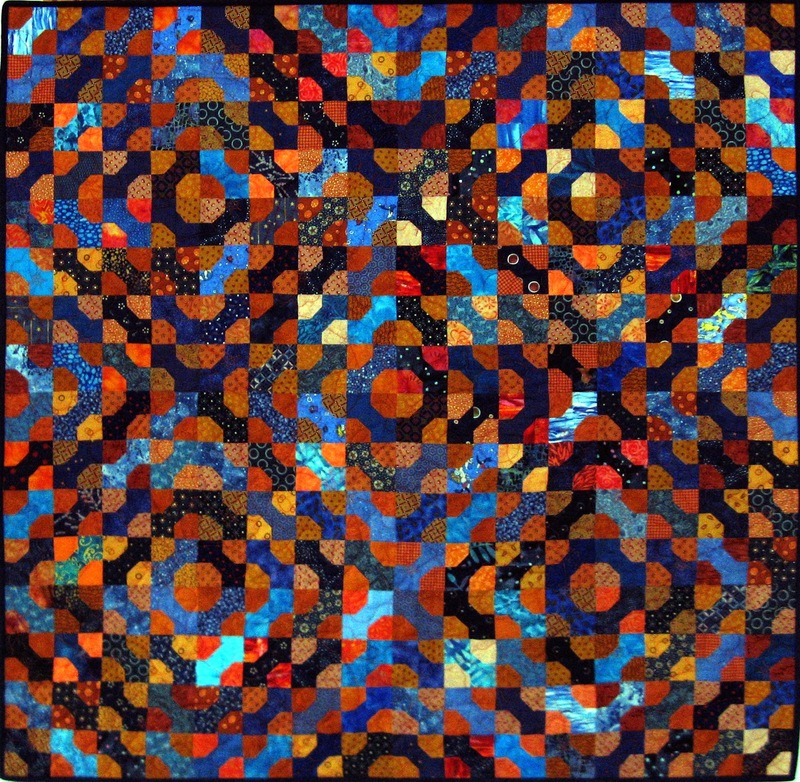 It still will be a bright quilt, just not with clear colors. I'll have pictures as soon as I can get the pieces together. My second activity for the day was Sunshine Quilters Monthly Meeting that had Jan Krentz as our speaker. Gosh does she have some wonderful quilts. There is a workshop that will be scheduled later this year during the summertime that I hope to attend. On to my sewing room! Moving slow on this project, but the momentum is sure to pick up this week. Mom is on her way home to Maryland this morning. Its always sad when she goes. There are just too many miles separating us. Mom is making a similar project (and so is Kerry). The three of us took a class at Road to California Quilt Show a couple of weeks ago. This project is Expect the Unexpected by Karen Sievert. It was the Friday Night Mystery. We didn't get much done the night of the class. Once the units are cut and assembled it goes together pretty fast. 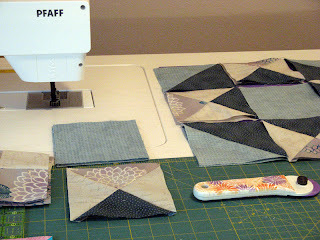 See what others have going on in their sewing rooms through the links at Patchwork Times. Nothing to report on either Used or Purchased this week. 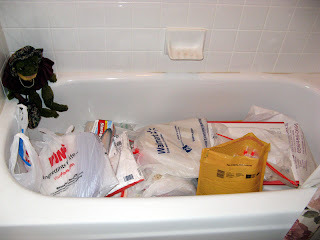 Mom and I have been doing all sorts of things that have taken us away from the sewing room. Sad that she'll be leaving bright and early tomorrow, but we've had a great last three weeks together. I have had a chance to do some weaving on my rug. I think I'm about half of the way now. 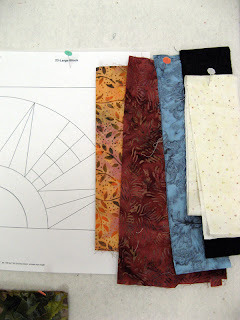 It has been great using fabrics that I have had stored for a long time, bits and pieces mostly...this being a big reason for wanting to make the rugs. Today we are heading out to Kerry's for lunch. We'll also visit Memory Lane Quilt Shop and Rosie's. These are two quilt shops that are a must when Mom visits. I'm continuing to work on my Expect the Unexpected project from the Mystery at Road to California Quilt Show. I've got my #4 February UFO to get started on and....Tuesday I start yet another project in a class. My sewing room is definitely becoming cluttered! Last set of 9" Neutral String blocks from the swap arrived last week. It has been a busy time with my Mom in town. With that said...last night we plunged into the "temporary storage area" and proceeded to sort out all the blocks. We sorted and sorted and sorted some more...checked and checked and checked again to make sure we had each grouping correct. 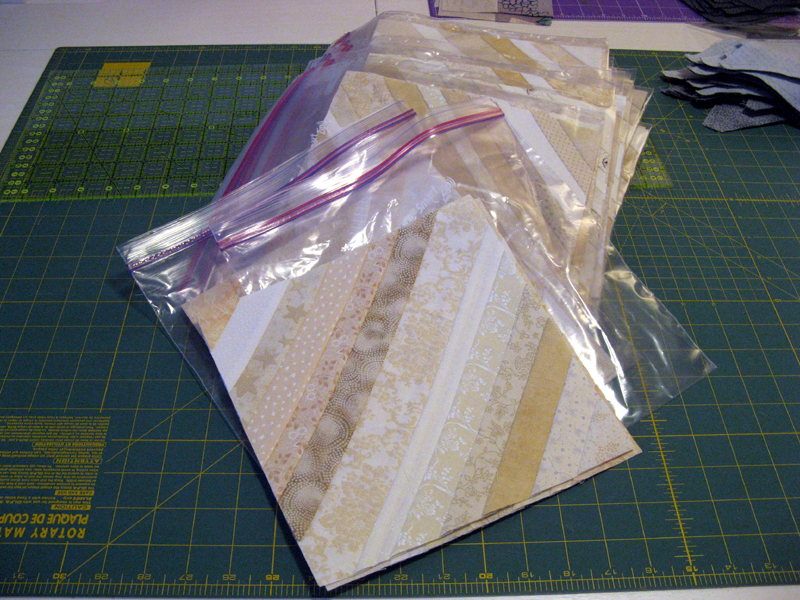 Here are the 19 groupings ready to put in their perspective owners packaging. Today I have them in my trunk ready for pick up or mailing across country. I am pretty certain Betty, Bonnie Sue, Chris, Collette, Debbie, Debra, Jeanne, Jennifer, Joan S, Joan T, Karen, Kerry, Liz, Louise, Mary, Susie, Teresa, and Theresa will be excited when they have their blocks. On to another project, Expect the Unexpected by Karen Sievert. This is the project that I have as my extra credit "lucky 13" with this year's UFO challenge. (January's Parade at 52 Quilts can be seen HERE.) I finished my January UFO on time. 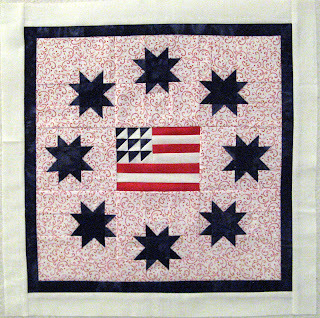 February UFO is a paper pieced patriotic design that finishes at the tiny size of 13 1/2" square. 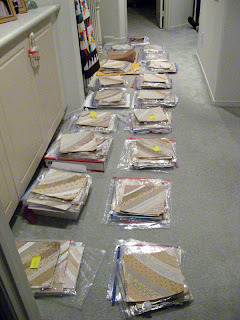 I have the pattern copied to paper waiting for a bit of time to look through my stash for the fabrics I'll be using. The calendar doesn't stand still so I'll be getting this one going pretty soon. And last to share a FINISH! My Mom has been working on this quilt since she's been visiting. It is a spider web string quilt that she brought to finish. Mom came with about half of the blocks done. She found the border fabric in my stash, a wonderful choice with all the other blues. The pattern is by Craftsy and is called Broken Spider Web. 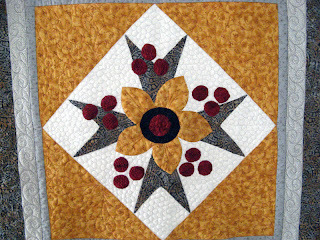 Bonnie Hunter also has this same pattern on her website HERE if you'd rather her directions. 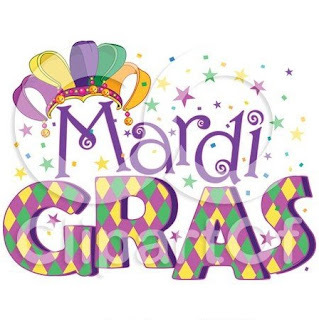 Here we are the first Monday of February...before you know it we'll be through another year. My goodness time doesn't slow down. I have been working on my #13 UFO (the project for extra credit). 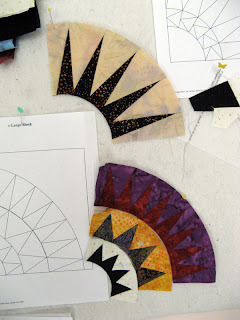 It is from the Mystery Workshop I took at Road to California Quilt Show last weekend. The project is called Expect the Unexpected by Karen Sievert. I have been trimming and making more blocks, but just breaking the surface with what will be needed for the project. I'm using my Bloc-Loc ruler to square up the HSTs. This is the project that has most of my attention. Something new I am trying to use up some scraps. The first row is the hardest, but I think I have gotten the hang of it. You stop after six to eight rows and turn the loom to do the next set of six to eight rows. Then flip it back and do another six to eight rows continuing the process until the weave meets in the middle. Apparently there is a tendency for an hour glass shape to come about in the middle if you only worked from one end to the other. The warp strips (running up and down) are 1 1/4" wide. 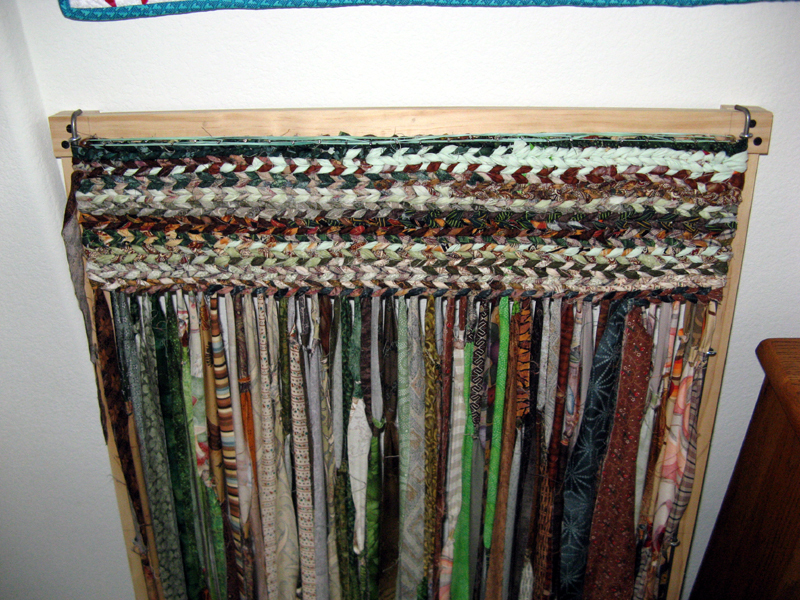 The weaving strips (running side to side) are 2 1/2" wide. 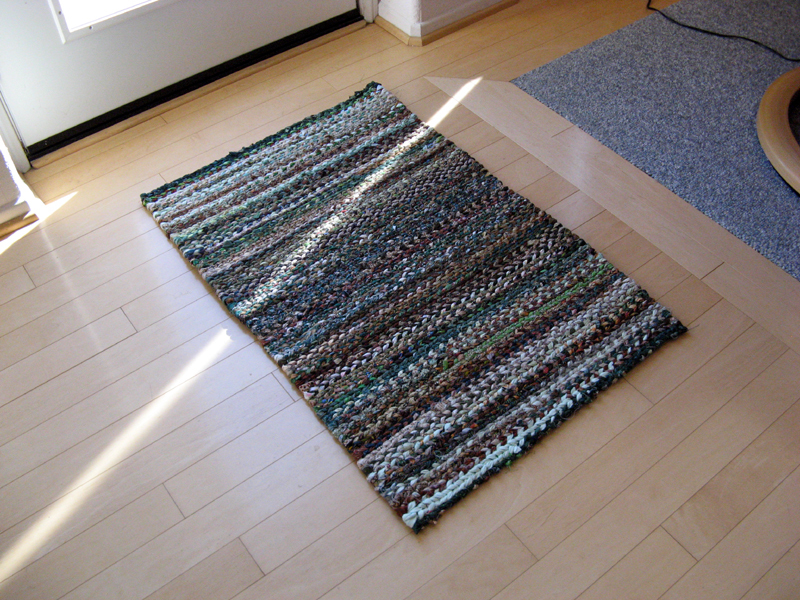 I've used anything brown and green for my first rug. It goes pretty fast and uses 17 yards of fabrics. On my Design Wall are three projects. The middle project is my Mom's. 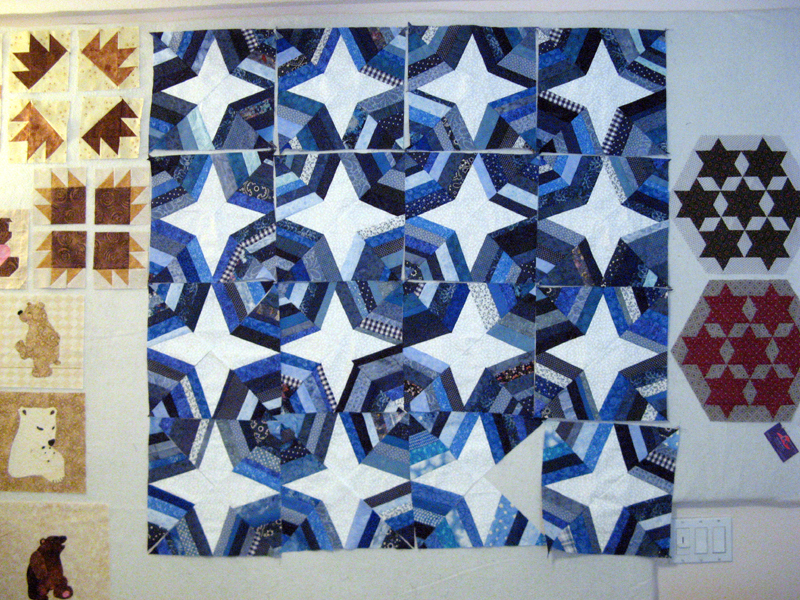 The first three rows are sewn into blocks. She's working on the last row now. The projects on the sides are mine. A bear block exchange on the left that only needs settings to pull the blocks together and on the right are the first two blocks of the second workshop I took at Road to California Quilt Show, Seven Sisters Simplified. Lots going on! 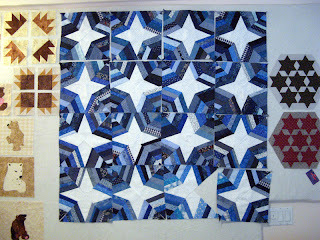 For more inspiration see other quilters works through the links at Patchwork Times. Enjoy your first week of February! I'm not sure what you'll be doing later today, but I'll be watching FOOTBALL! 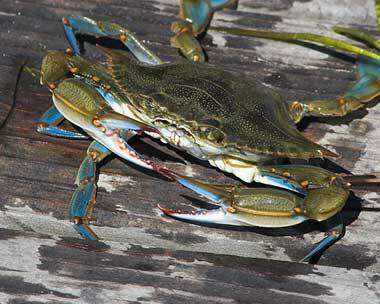 Being that I'm a transplant to California from Maryland rooting for a team will be a tough decision for me. DH will be rooting for San Francisco and Mom will be rooting for Baltimore. There have been all kinds of things written in the papers about the big sporting event. One I thought was interesting was on what foods to serve. There was an entire line up of San Francisco foods that included Dungeness crab and Ghiradelli chocolates and a great beer from the area. The list of San Francisco foods was tough to beat. 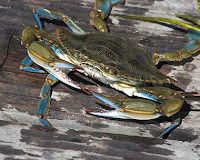 Baltimore came in with Blue crabs and Lady Baltimore cake and a beer that just isn't too my liking. What threw me to San Francisco line up was the beer! I do enjoy a good IPA! Who will you root for? I've not done much quilting this week other than the Travel Case. I'll be gathering fabric today to start my February UFO. 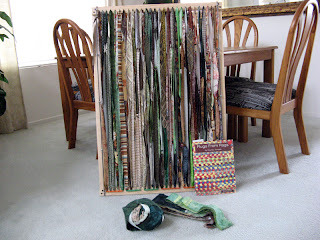 See how others use up their fabrics at Patchwork Times. Hope your team is a winner today! Well today is Ground Hog's Day. Was there a shadow? I've not heard yet... There's been no shadows in my sewing room I'm happy to say. 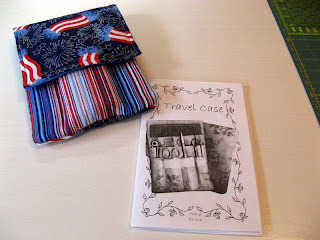 Mom and I took the Travel Case workshop at Bits and Pieces on Thursday. We are happy with our Travel Cases. Plan to change up the batting with any that we make in the future. What we used was a bit thicker than what we really needed. I got my January UFO #5 in on time. Aunt Marti pulled #4 to work on in February. Here's what you'll be seeing me work on during the month. 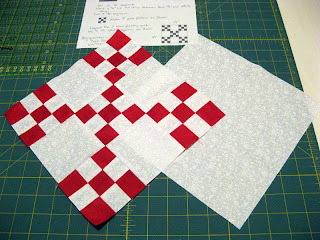 It is a small one finishing 13 1/2" square. I'll be calling my project Kadette. 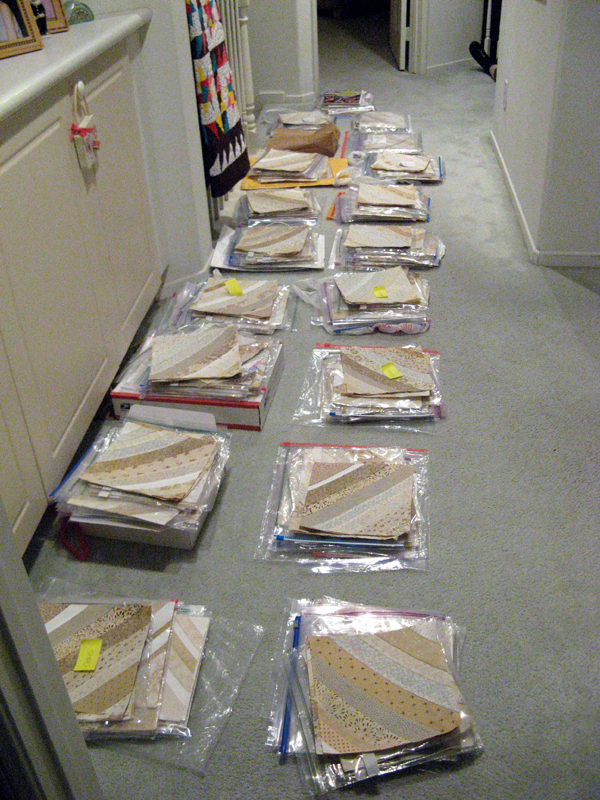 If you want pattern information check out my list of 2013 UFOs in my Pages at the right. Next up a completion! Kovers is finished. 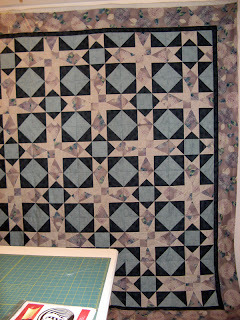 Kerry's Quilting did a terrific job on the quilting. I'm so happy with how this mystery project turned out. 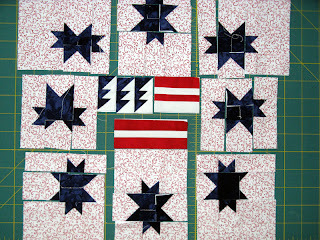 The quilt finishes at 71" square. 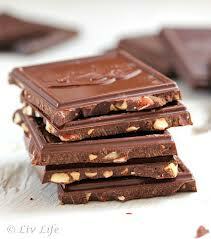 Have a terrific day today. Find time to do what you enjoy most. I'll be sewing with my Mom!